This is a book that had been on my radar for quite some time--I mean, just look at that title. I also follow the author on Facebook (she is hilarious), so I felt like it was going to be the perfect vacation read. And it was, but it wasn't quite what I expected. I went into reading this thinking it would be a light romp featuring a more mature heroine. Instead, I found a more thought-provoking and sensitive novel, which still led me to laugh more times than I could count. I appreciate that Rothstein was able to balance humor and seriousness. The scenario of a long-standing marriage in jeopardy is not a funny one and Rothstein never tries to make light of it. Instead, the humor comes from Marcy's insight and reactions. Not only does this lighten the mood, but it adds great depth to Marcy. I found her to be a believable and sympathetic character, and one that I rooted for. Around Marcy is a colorful cast of characters. Rothstein hits the sweet spot for the size of her supporting cast. Every character plays an integral role in Marcy's life and they help to propel the plot forward. Each person was distinct and fleshed out, with the exception of Harvey. But, honestly, this book isn't about Harvey. He's obviously important to the situation, but what is going through his mind isn't important to the story. Once I was able to devote time to this book, I was hooked. The plot moves smoothly and swiftly and Marcy's experiences were authentic and believable. There were many times when I really wasn't sure what decision Marcy would make and, even if I didn't agree with what she chose, I could still believe that she would choose it. This was an entertaining novel with more depth than I expected. It is one that I would recommend to anyone wanting something humorous and deceptively un-fluffy. I purchased my own copy of this book, but I was solicited for this honest review. If you would like to read more about this book, please visit some of the other stops on the blog tour. 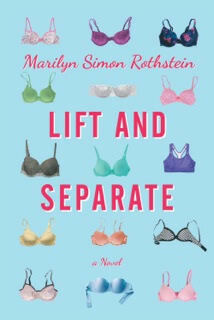 Thanks to TLC Book tour, I have one print copy of Lift And Separate for one of my viewers. This giveaway is open to readers in the US and Canada and will run until midnight (Pacific Time) on July 25.